The plantable space available to Martha and me near our apartment is limited to a 8×20″ window planter in which we raise a jumble of herbs every summer and fall (last year we also tried small pots with tomatoes on other windowsills, but they jumped to their death in a windstorm). This is hardly enough dirt time to satisfy a couple of hip young urbanites such as ourselves. 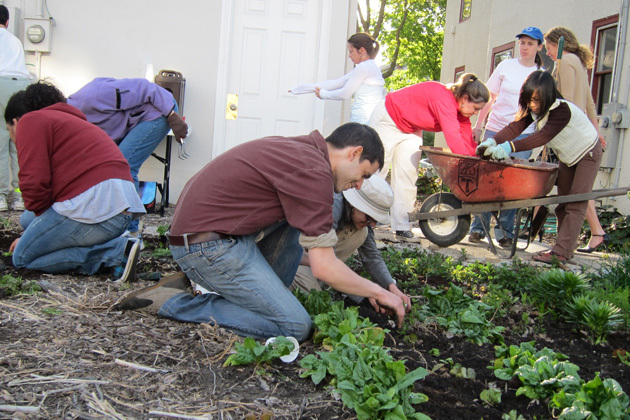 Happily, Common Roots Café stepped in — this year and last — with the opportunity to help plant and maintain the beautiful garden located behind their restaurant. And so it was last night that I donned my nearest imitation of farmer clothes and dug in the dirt, mixing fresh compost into the old soil and planting the plugs and seeds that will grow into Common Roots’ bountiful summer garden. 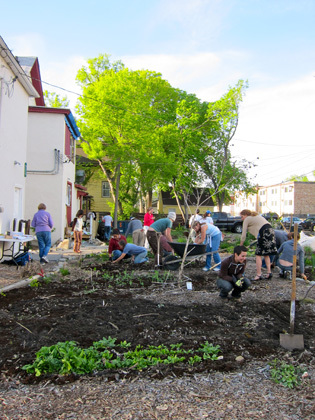 Normally, I might express a little cynicism about volunteering for a for-profit business, but Common Roots is a great asset to our neighborhood and city, and in springtime I’m so desperate to garden that I’d practically pay for the pleasure. Besides, the array of spreads and veggies provided for volunteer snacking privileges is more than worth the price of admission (that price being getting your hands a little dirty). This entry was posted by Tom on Wednesday, April 28th, 2010 at 7:12 am and is filed under Garden, Minneapolis. You can subscribe to responses to this entry via RSS.